I recently attended The National Retail Federation (NRF) Expo in New York City, the largest show of the year for the world’s biggest retailers. More than 600 exhibitors and some 35,000 people attended the show, including an impressive number of leading high tech vendors. In fact, with some of the biggest names in IoT tech presenting huge, elaborate exhibits in the expo hall, it seemed like NRF has become the technology show for the retail industry. 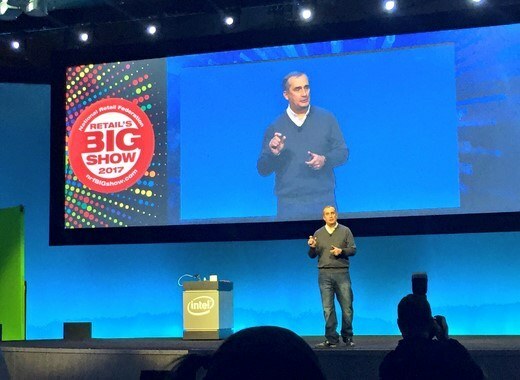 Intel CEO Brian Krzanich delivered a keynote address on the second day of the expo, highlighting the role of data and smart connected technologies in transforming the shopping experience. As an example of new retail innovations, BK introduced Tally from Simbe Robotics, the world’s first autonomous shelf auditing and analytics robot. Tally works with regular human co-workers by providing information to ensure that the store’s products are always stocked, shelved in the right place, and labeled with the right price. Powered by an Intel® Core™ i7 processor-based NUC and Intel® RealSense™ cameras, Tally can operate alongside shoppers and co-workers on the sales floor, and is a great example of how Intel is working with its ecosystem of partners to create cutting-edge IoT retail solutions. And Tally is just the beginning. 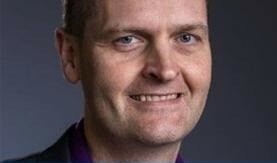 In his keynote, BK announced plans for a five-year $100 million investment in the retail industry, and introduced the Intel® Responsive Retail Platform (Intel® RRP), which brings together retail hardware, software, APIs, and radio frequency identification (RFID) sensors in a standardized platform. Together, these announcements point the way forward for Intel’s wider efforts to integrate Internet of Things (IoT) and other technologies, such as augmented and virtual reality, into retail. Intel offered 19 in-booth demos, including live demonstrations of new Intel-based retail solutions such as digital signage, intelligent vending machines, and even a 3D knitter that can weave on-demand clothing. 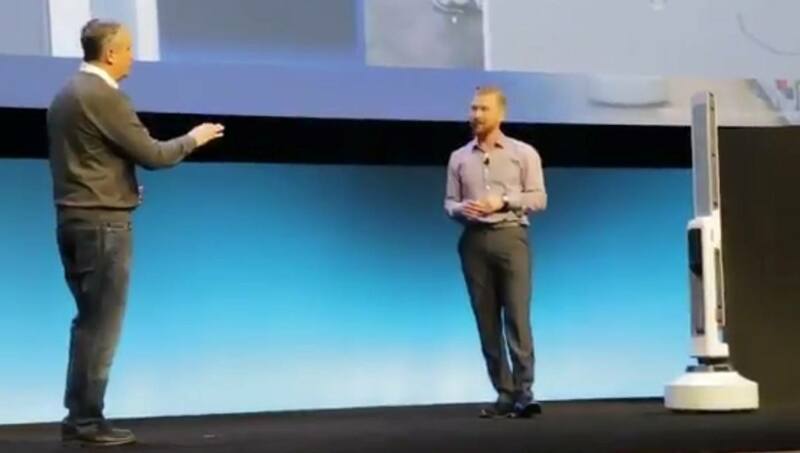 I also helped present a demo of the joint Intel and SAP retail IoT solution based on Intel® RRP, SAP* Dynamic Edge Processing software, and the SAP* HANA database. This platform addresses the age-old retail challenge of inventory management: making sure that just the right amount of inventory is on the shelves in the exactly the right colors and sizes to meet the needs of consumers. To learn more about the Intel and SAP IoT platform, read the solution brief Solve Age-Old Inventory Management Issues with Intel, SAP, and the IoT. Watch our video Empower Your Business with Intel & SAP IoT: Real-Time Analytics at the Edge to see how innovative Intel and SAP technologies provide real-time IoT sensor monitoring and intelligence at the network edge, synchronized with rich analytics in the cloud. The joint SAP and Intel retail solution addresses three key retail use cases. The first is the broadest: efficiently managing inventory for the highest level of sales. It’s an industry rule of thumb that in a standard brick and mortar store a salesperson or customer can dependably locate a specific piece of inventory only 65 percent of the time. In other words, at any given time, almost a third of a store’s inventory isn’t where it’s supposed to be: the shirt you are looking for, in the color and size you want, might be mis-shelved, not yet unpacked, or in a pile in the changing room. With RFID sensors used in conjunction with the Intel and SAP retail IoT platform, RFID scanners can easily locate inventory anywhere in the store. Unlike bar codes, RFID tags are unique identifiers, and can be programmed with whatever information is important to the retailer. So a store employee could point an RFID scanner at that pile of clothes in the changing room, and instantly know the size, color and price of each article of clothing in the heap. With RFID technology, the retail IoT system is able to boost the ability to dependably locate specific inventory items to 98 percent, and that goes a long way toward increasing both sales and customer delight. A second use case for RFID technology and the joint SAP-Intel retail platform involves supply chain management. With RFID tags attached or embedded into merchandise by the manufacturer, you can receive items into inventory without even opening the box by simply reading the RFID tags on the still-packaged merchandise. This cuts down on time spent on receiving inventory, and – with inventory still in its box – also cuts down on the risk of loss due to theft. A third use case involves using RFID scanners in conjunction with point of sales (POS) systems to identify shoppers who have previously purchased merchandise in the store. RFID scanners on the store’s shelves and fixtures can read signals from tiny, un-removable RFID tags embedded directly into clothing or personal items such as a purse to identify these items and link that information to the shopping history of the customer who purchased them. Sending an alert to the POS to reveal a customer’s shopping preferences enables store staff to personalize their customer service, with the hope of boosting sales. With retail IoT technologies from Intel and SAP, retailers get a smart solution for their inventory-management challenges, so stores can better track the inventory that keeps customers coming back and deliver a superior customer shopping experience. Intel and ecosystem partners like SAP are building the technologies that will help transform the retail experience of the future. Follow me on Twitter @TimIntel for the latest news of Intel and SAP.